Kuthiramalika, the Palace of Horses, greets its visitors with 122 horses smiling at the guests. Built by the Maharaja Swathi Thirunal Balarama Varma, the palace is a two storey building located near the Sri Padmanabhaswamy Temple in Thiruvananthapuram. The palace was built in the 1840s and is made of rosewood, sandalwood, marble and granite which is an exemplary icon of the Kerala style of architecture. The palace is also called as Puthen Malika. The palace consists of 80 rooms among which only 20 are open for visitors. 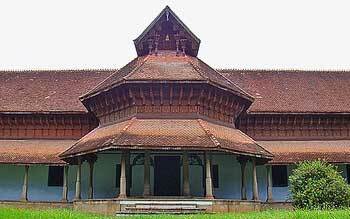 The museum is a part of the Palace and houses the assets owned by the Travancore royal family. These include Belgian mirrors, Life-sized Kathakali mannequins, paintings, chandeliers, furniture, Greek statues, armaments and a musical tree which produces eight different sounds on tapping. The wooden staircase of the Palace consists of spectacular paintings of peacocks, dragon and elephant. The palace has in display two royal thrones, one which is made of 24 elephant tusks and the other which is made of Bohemian crystal. Pazhavangadi Ganapathy temple and the Vellayani Lake. The palace is closed on all Mondays. It is open on all other days during 8.30 am to 1.00 pm and between 3.00 pm to 5.30 pm. By air : The nearest airport is the Trivandrum International Airport which is at a distance od about 6 kilometers. By train : The nearest railway station is the Thiruvananthapuram Central which is about a kilometers distance. By road : The Kerala State government provides bus facilities from all parts of the State to Thiruvananthapuram which is the capital of the state.